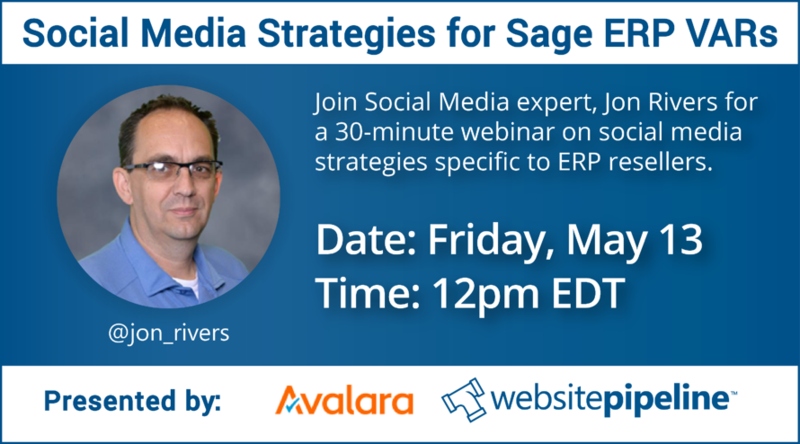 Website Pipeline and Avalara are co-sponsoring a webinar on Social Media for Sage ERP Resellers on May 13th. In this 30-minute session, you'll be hearing from social media expert Jon Rivers of Marketing Monarchs. Jon's track record of success proves that he understands the nuances of marketing for ERP resellers. What is the cost of NOT being on social media? You'll have several actionable ideas after this session on how to use social media to help your business. If you're a Sage Reseller, you'll definitely want to attend this webinar.